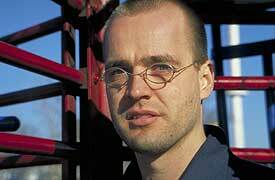 Saxophonist, bass clarinetist, and composer Christof Knoche was born in Bremen, Germany, in 1967. At about 16, he started playing the saxophone. Following his graduation from high school and two years of obligatory German civil service, he pursued jazz saxophone studies at the Hocheschule für Musik and Theater in Hannover, Germany. Throughout his time there and his prior two years in civil service, Knoche found time to jam with the many talented musicians in the rich Hannover scene (including master trombonist and improviser Albert Mangelsdorff) and to play as a sideman on local world music festivals. He worked with the Tuvan throat singer Huun Huur Tur, Nahawa Doumbia, Egyptian master-violinist Abdu Daghir, and many others. During that time, Knoche was consecutive winner of the 1993 and 1994 nationwide competition in Germany for composition and performance sponsored by the prestigious Jazz Podium magazine. Knoche also served as Composer and Musical Director for the Niedersächsisches Schauspielhaus" in Hannover. In 1997, he moved to New York for graduate studies at the Manhattan School of Music in Jazz Saxophone and Performance. As part of the Manhattan Jazz Orchestra, he toured Scandinavia, performing a prominent festivals there. He also played, in 1996 and again in 1998, in the Global Groove World (GGW) Band, featured at European world music festivals. The GGW consisted of artists from diverse locations such as Mongolia, Siberia, Turkey, Cameroon, Mali, Egypt, and Germany. In 1998, Knoche won Down Beat magazine's worldwide competition for Best Student Ensemble for Line Zero, a band he toured in Germany in 2000, appearing at major festivals and on TV and radio. Their debut album, Line Zero, was released in March 2003 by OmniTone. Besides teaching, Knoche is presently working as a leader/co-leader of various ensembles, freelance sideman, and leader his ensemble with trumpeter Russ Johnson, bassist Bob Bowen, and drummer Dan Weiss, Line Zero.